My goal was, and still is, to beat 25 SNES games to celebrate the 25th Anniversary of the SNES. 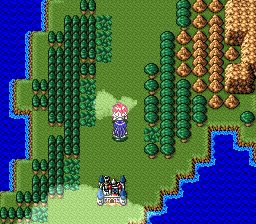 But Lufia and the Fortress of Doom is proving to be quite the stumbling block. 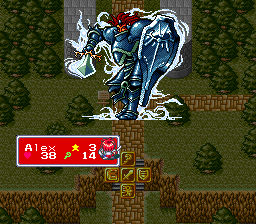 The SNES is known for its JRPGS and while I am intimately familiar with the cream of the system’s crop, I have never managed to spend much time with some of the genre’s second tier games. That is where, by most accounts, Lufia fits on the SNES hierarchy. RPGs tend to take a lot more time to complete than brawlers or platformers, but I thought I could space them out and keep the write-ups coming at a steady clip. Lufia is smashing that plan to pieces. I have been playing Lufia off and on since the start of February. So far I have found it stultifying and dull. Part of that is because I have played the first few hours before, when I borrowed it for a week from a friend in grade school. The other is that other than the intro, there just isn’t anything interesting about the first five hours or so of Lufia. It plays like a checklist of all the usual JRPG tropes. Burned villages, mystery orphans, suddenly resurgent monsters, all the classics. When done right, those things can work. What it usually takes is strong writing. The Lunar games don’t stray far from cliché, but everything is done with enough charm that it works. 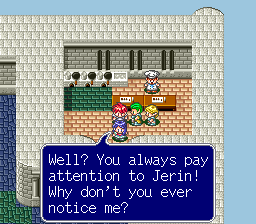 The localization of Lufia is bland. There is little personality or reason to get invested in these characters or this world. That is not to say there aren’t some good ideas. The callous disregard for one destroyed kingdom kind of works, with people being more annoyed that legitimately concerned. Working with the princess because the King doesn’t care gives it something to work with. Too bad that results in the first hour and half consisting of running back and forth between two places, with almost no sense of progress. The one outstanding part of the game so far is the opening. Lufia starts the player at the end of another story, setting the backstory by allowing the player to take control of the legendary heroes. That part works perfectly well. It is great to start with characters that are already supremely powerful; wiping the floor with what is essentially a final boss. It is also the only early story moment that manages much emotion. Even not knowing the four characters, seeing them have to make the sacrifice they do is powerful. Unfortunately, none of that is carried over into the rest of the game. So am giving up on Lufia halfway through. For now, anyway. I am simply moving it to the bottom of the list. If I get back to it great, if not too bad. When I do get back to it, I will do another write up, assuming I have anything new to say about it. I might not. If I want to finish this project, I need to keep moving. My list of games to play did include 26 or 27 just in case I proved incapable of beating one. For now, I am moving on from Lufia to Super Mario RPG and some kind of shooter, I haven’t decided yet.